Modern technologies give us a chance to greet people on their Birthday quickly. We can just turn on the computer and send a message with greeting words, or post a greeting picture using Facebook or some other social media. Nevertheless, many people prefer the old-fashioned way - postcards. It helps to save the essence of a gift and to make someone feel special. When we talk about DIY postcards, there is nothing more heartfelt. Furthermore, it is quite easy to create one. So we decided to share with you the best ideas of DIY postcards. Take recycled cardstock and a ribbon. Define the length of the ribbon you need to put on your postcard. Use scissors to cut the ribbon. Take glue and put it directly to the back side of a ribbon. Then carefully place a ribbon on the left side of your cardstock. Use letters pattern to set a message you would like to have on the front side of a card. Take flowers and glue. Add a little bit of glue to the back of each flower and carefully cover your postcard with them. You can also use some glitterings to make your creation bright and attractive. Write a warm message inside of cardstock. It is ready! Take a cardstock and a pen. Make some dots to point out the position of balloons. 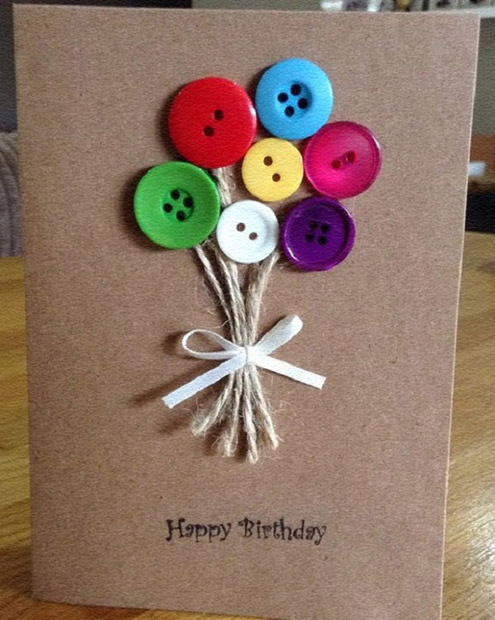 Take a needle and cotton, some colored buttons and carefully sew down the buttons to create balloons. Take a black pen and paint lashings. Here we go, the postcard is ready! It will take around 10 minutes to make it, and your dad will be happy to get this funny creation. 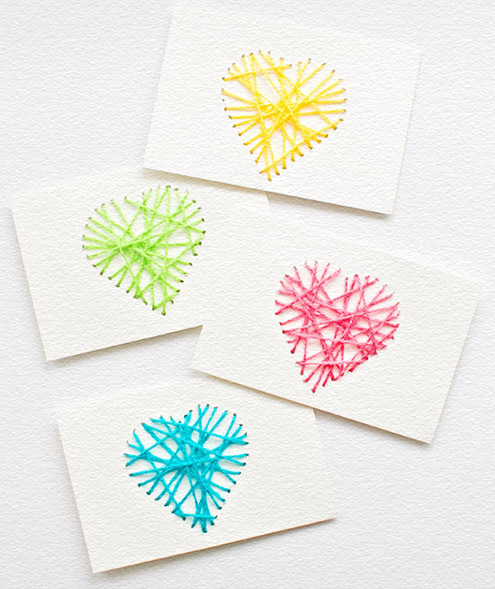 Surprise your sister with a vivid postcard made of heart-shaped balloons. It will take around 10 minutes to create it, and the method is quite similar to the previous one. Take a card stock and a piece of splash paper to create a background. 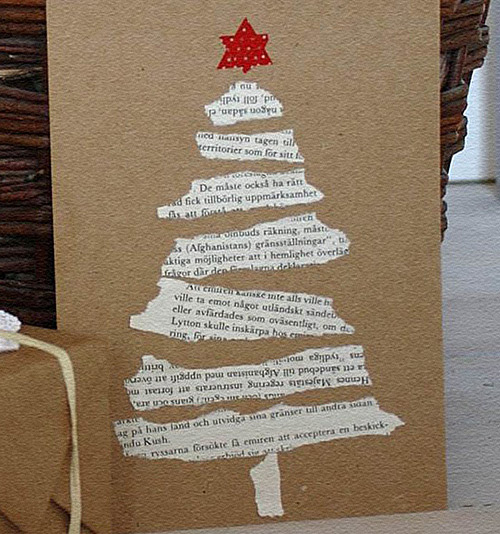 Use scissors to cut a splash paper and make it a little smaller than the size of a card stock. It will create an illusion of a frame. Choose any color you like. Still, try to avoid vivid colors to make some contrast with your future balloons. 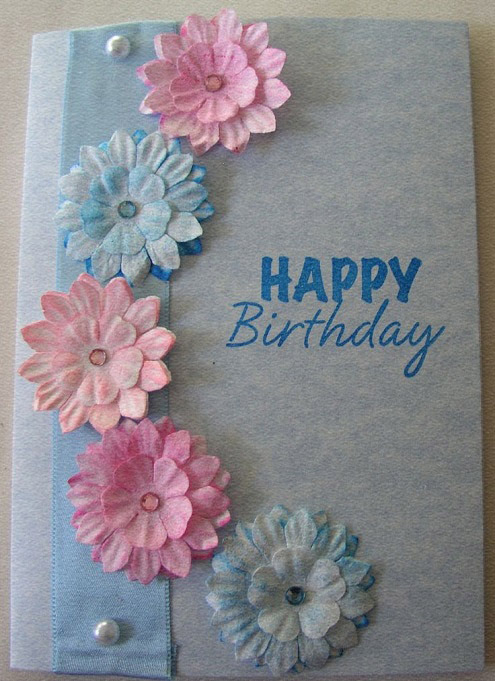 Use glue to stick splash paper to your cardstock. Try to place it right in the center. Take more papers of different colors to make hears. Double up sheets of paper, put them together, paint a half of a heart next to a fold line and cut hearts using scissors. Cutting hurts feels great, right? Take glue and carefully stick the hearts one by one to create a balloon bunch. Take a red thread and cut it to create about five lashings. Use glue to stick them on your card stock and your postcard is ready! Take some sheets of paper of blue, gray and beige colors. Use scissors to cut six or more rectangle. Take each box and pleat it. Take glue and stick pleat papers to your card stock. Use paper of some vivid color and cut a ribbon. You will have to cut two triangles, one from each side, to create the shape needed. With the help of a letters pattern, place the message in the middle of your paper ribbon. 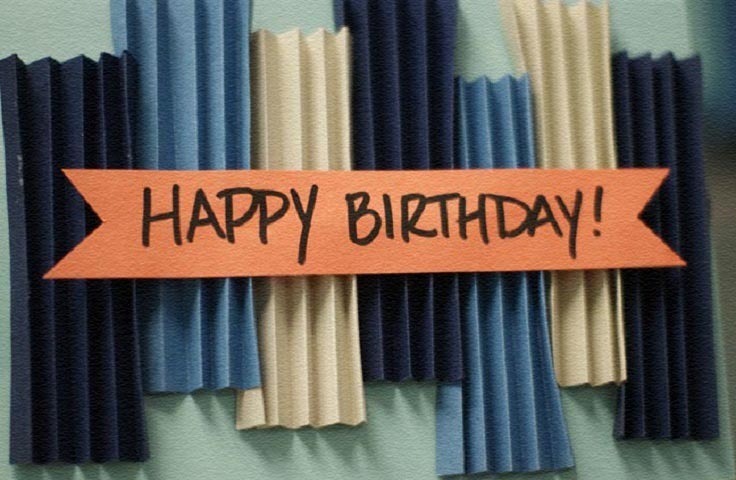 Use glue to stick your ribbon upon pleated papers. Your brother will love this understated postcard! Use letters pattern to create a message. You can use your imagination, humor, whatever. Any words that will make your friend smile will be the best. It is the last one, no jokes. 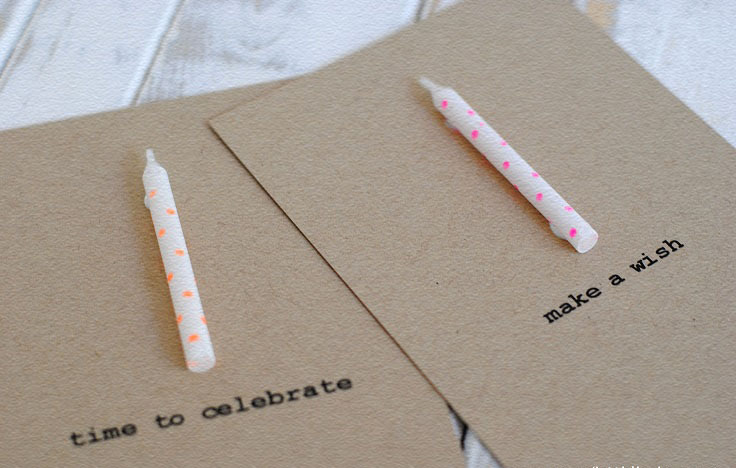 Just take a birthday candle or a few of them and stick it to your card with the help of superglue. The super easy and super trendy postcard is ready! Create 36, 52 or 56 pieces of paper (depending on the pack of cards you use) to cover the back side of each card. Use glue to stick these pieces right to the middle of each card as showed. Write down the messages you want to share with your boyfriend. 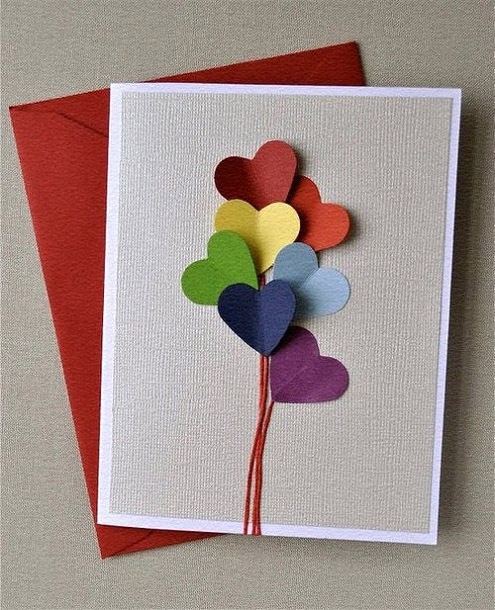 Use pricker and iron rings to fasten together all the cards. 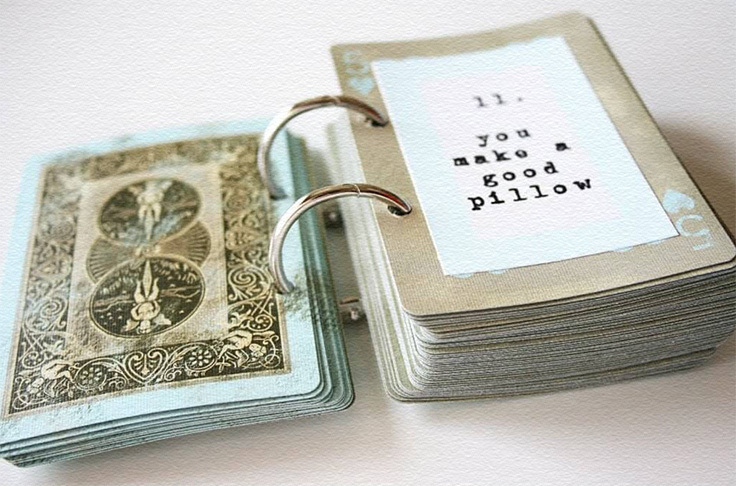 Now you have a little book full of lovely messages! Take a pencil and paint a heart in the middle of your postcard. Use a needle contour the heart with little holes. Use rubber to remove a pencil from a card stock. Take a needle and cotton and make cross stitches. When you will see that the cotton creates the shape of a heart, your postcard is ready!